STUDENT SAVOR: Its winter! Let's eat toffee. Its winter! Let's eat toffee. Here I am, sitting at Logan Airport waiting for my flight to board. I'm thinking "What could I possibly do with all this extra time on my hands?" --now that the super hectic Fall 2011 semester is behind me--and then I realize I have a blog that I've been ignoring for the past four months. Now before I blog about food, I'll share a little bit about life. I turned 22 yesterday. (Insert angry/sad/annoyed face here). If you don't know this about me already, I hate getting older. Sure, I am approaching the peak of my life (blah blah blah) and I am probably overreacting about my age, but the fact is, time is really flying by and I am not liking it. I want to be a kid again. I want to go back to my high school graduation; or to the moment I moved into my first (or second) apartment. Please someone come up with a solution for me! Enough of my age-related rambling. Let me talk about the amazing winter break that awaits: two places, two climates, two holidays and hopefully a whole lot of presents! Oh and in between the celebrations and relaxation I have a magazine to plan. TasteBUds is up and running, but it needs a lot of tweaking and organizing. Here is a our first issue. Anyways, during break, I plan on spending some time setting next semester's deadlines, compiling a style and writing guide, contacting advertisers and testing recipes for our next issue. Ok, now it's time to talk about food. Here is the toffee I made for a holiday party a couple of weeks ago. I tweaked this recipe a little because honestly there was not enough chocolate in it! At least not in my book. Oh and also, be prepared to stand near the stove for a long time. Preheat oven to 350 F. Spread almonds evenly on rimmed baking sheet and put in oven. Roast until fragrant, but not burned, about 15 minutes. Remove almonds from oven and let cool. Transfer to Ziploc bag and pound nuts, using a heavy object, until coarsely ground. 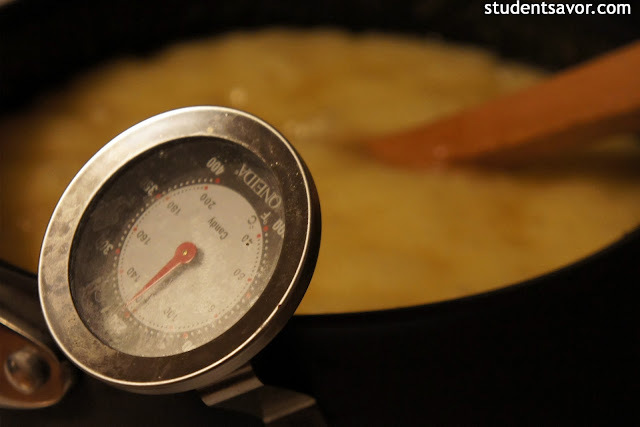 Melt butter in a large heavy pot over medium-high heat. Add sugar and continues stirring until toffee reaches 305 F on a candy thermometer, about 30 minutes. 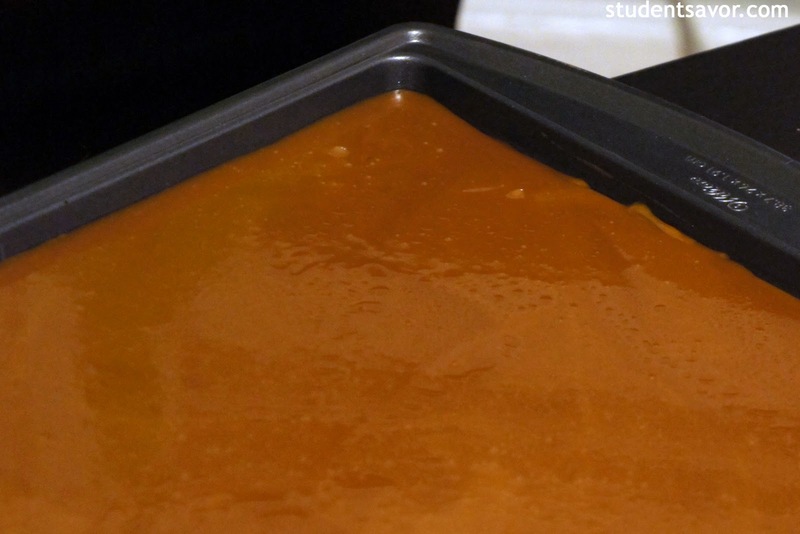 Pour toffee onto rimmed baking sheet, spreading evenly to cover. Let cool until slightly hardened but still tacky. Run a knife along edges of sheet to facilitate removal later. 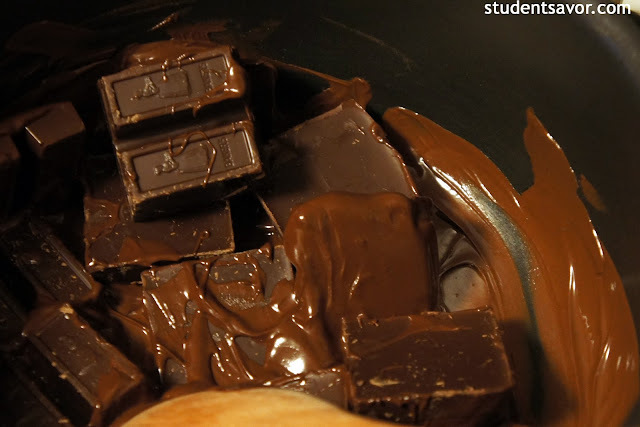 Meanwhile, melt chocolate in a bowl set over simmering water. Remove chocolate from heat and let cool, about 2 minutes. 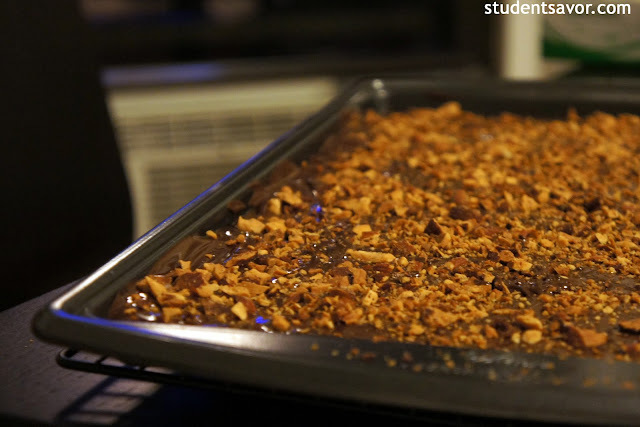 Immediately pour chocolate over toffee and spread evenly. Sprinkle ground almonds over chocolate; pressing down gently with a spatula. Transfer toffee to refrigerator until set, about 1 hour. 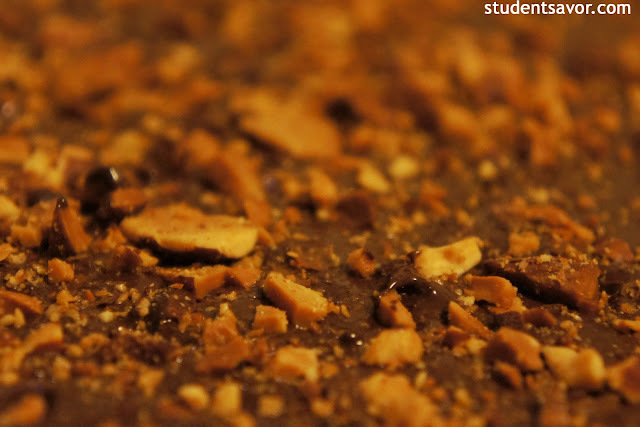 To remove from pan, run sharp knife around edges and lift toffee from the bottom. 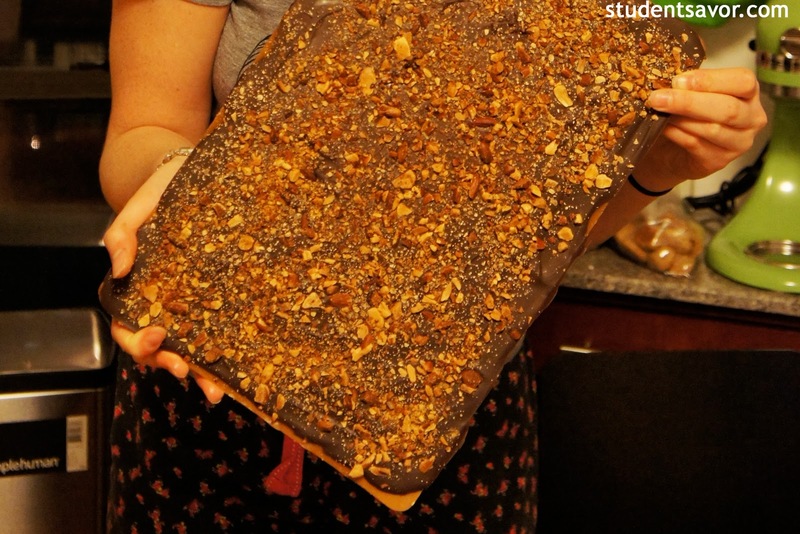 Break into large pieces using hands and store in freezer until ready to serve.